Shop signs can use many features described in our other categories such as illumination, flat cut letters and built up 3D letters. You may have a clear idea for your shop signage, equally you may be confused by all of the options, either way let us help fill in the gaps and below is a showcase of the shop signage that we produce and install here at Edge Signs. HOW SHOULD WE PRESENT OURSELVES? 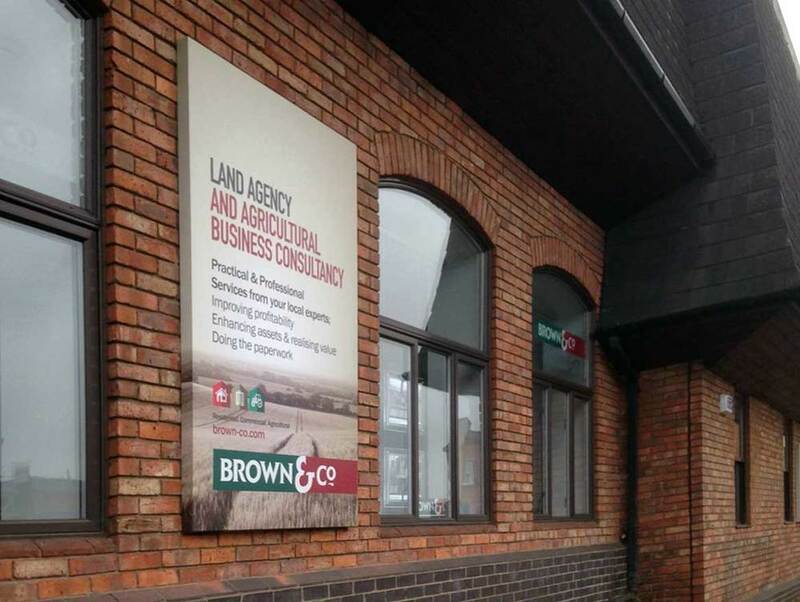 For external flat panel signage we use an aluminium composite panel which is stable, strong and rigid. We then apply graphics to the face in the form of coloured vinyl or print. Flat panel signage is a low cost option but is still very durable and long lasting. These signs would be fitted with fixings through the face in the corners or specialist tape for a fixing free finish. We have introduced our low cost brushed stainless steel effect signage as depicted to the right. We mount a satin clear print to the front of the brushed ACM panel to create a high end finish at a low end cost. Sign trays are becoming the most popular style of sign board particularly as a main fascia sign for stores and businesses. Sign trays are 3D and without fixings to the face breathe a style and elegance into the signage. Often powder coated they serve as a perfect background from vinyl lettering to flat cut letters, built up 3D letters and illumination. We can also apply prints which wrap around the sides for added style. 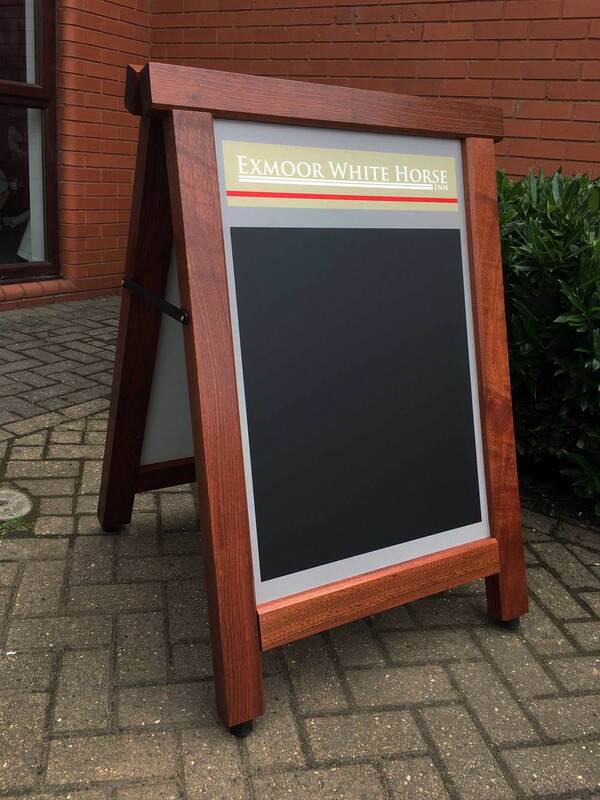 Break from the norm by choosing curved or shaped sign trays. This unconventional method is a great way to introduce a logo to the sign and creates a unique and stylish finish. Curved faced sign trays in certain situations can help achieve a corporate look to the signage. Brushed stainless steel curved sign trays are timeless and simple yet present real style. Sign trays prove to be a fantastic stylish background to display your logo and lettering in a more eye-catching way. Adding 3D elements to the sign can really help achieve this. Flat cut letters adhered to the sign tray directly or stood off with a spacer is one of the simplest yet most effective methods. When we frame our signs traditionally we always use hardwood and not softwood. Softwood quite simply isn't suited for long term external use. Our hardwood framed signs can be painted or oiled to bring out the grain in the wood. We use an aluminium fly sheet set within the hardwood frame instead of the often used plywood method, as this will not perish and will keep your wooden sign looking great long term. Hanging signs, also known as 'blade signs' are typically double sided and have almost become a necessity in high streets and shopping villages. You can choose to have your hanging sign in a range of ways; from slick, frame-less aluminium to hardwood frames or simple low cost single thickness panels. Logos and lettering can be displayed on the hanging signs in the form or vinyl letters, printed graphics, 3D lettering or can even be illuminated.